Synopsis: John works in his family’s mortuary and has an obsession with serial killers. He wants to be a good person, but fears he is a sociopath, and for years he has suppressed his dark side through a strict system of rules designed to mimic 'normal' behavior.Then a demon begins stalking his small town and killing people one by one, and John is forced to give in to his darker nature in order to save them. As he struggles to understand the demon and find a way to kill it, his own mind begins to unravel until he fears he may never regain control. Faced with the reality that he is, perhaps, more monstrous than the monster he is fighting, John must make a final stand against the horrors of both the demon and himself. Most people are normal. Some are not. John Cleaver is one of those who isn’t; he is obsessed with death and he has all the traits of a serial killer. There’s only one difference between him and every serial killer he’s ever studied: John wants to restrain the evil thoughts that his evil side thinks of, because he really isn’t a serial killer. Well, at least not yet. He’s compiled himself a set of rules that should stop him from turning into a serial killer. He was doing quite well, actually, until a murderer started killing innocent lives in his home town…. 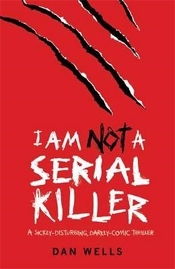 I read Mr Monster a while back, never knowing that it was actually book two of three…so I decided to catch up and read I Am Not a Serial Killer, Dan Wells’ debut novel and the first book in the series. Having read Mr Monster beforehand, I already new what was going to happen; Mr Monster talks about it quite a lot. But the good thing is that even though it mentions what eventually happens, it doesn’t really explain how it happens, and so I suppose for me the thrill came from watching the story unfold to see how John Cleaver got to how he is in Mr Monster. Being book one, I expected quite a lengthy character introduction sometime during the first few pages. Initially, I was surprised not to find one; I Am Not A Serial Killer delves straight into the embalming process (Dan Wells must have spent a while researching it, it’s that detailed!) and we never really have an introduction. On reflecting, I don’t think John Cleaver needs to be introduced; the whole book, in a way, is about him, and we discover more about him all the time. There isn’t really a need for us to immediately know everything about John, as IANASK is essentially a book about us discovering what makes him tick. Well, it’s that with some fantastic thriller elements mixed in. I think I mentioned in my Mr Monster review that John Cleaver was quite a fantastic character. IANASK is just the same; character development, certainly for John, is central, even though the story arc is about John trying trying to stop a serial killer. But it isn’t just a character driven story. Oh, no…. Quite the opposite. I Am Not A Serial Killer also has a great thriller/horror element. Towards the end of the book, there is very high tension, and I couldn’t bare to put the book down, I was so engrossed. I felt this even though I knew how it would end; so I suspect that those of you who aren’t as daft as me to pick up book two first will find even more thrilling. Which is good, I hope! What about the prose, I hear you say. Actually, you probably didn’t ask that, but I’m going to tell you anyway! I did cover this a bit in my other review, but I thought it worth mentioning again, as this is book one. Basically, I Am Not A Serial Killer is written in first person, which I think benefits the story greatly. Seeing as this book is all about John and his ‘dark side’, it is only fitting to hear the story from his point of view, and I think the use of first person rather than third person makes IANASK a much more personal an intimate story. I Am Not A Serial Killer is a fantastic contribution to the YA genre, incorporating all the greatest elements a story could have. IANASK is a dark and thrilling book… I’d be surprised if it isn’t in the top 10 favourite novels of most young adults, because it is certainly one of my favourite books! I just hope Dan Wells continues to write such great narratives for many years to come. What did you think about I Am Not A Serial Killer?